Pentagon planners have switched from asynchronous transfer mode to Gigabit Ethernet for the first wedge of the 58-year-old building's 14-year, $1.2 billion renovation. The initial design was influenced by the industry focus on ATM at the network edge, said Col. Robert Kirsch, who is managing the information management and telecommunications renovation. 'When the Gigabit Ethernet standard was approved [in 1998], we had to take another look at the business case for staying with ATM,' Kirsch said. 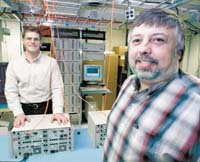 Bob Marini, left, and Michael L. Watson of General Dynamic's Pentagon renovation team had to find the right Gigabit Ethernet switch for 4,600 users. At first glance, it seemed like a no-brainer to abandon a 155-Mbps, OC-3 ATM backbone in favor of a 1-Gbps Ethernet backbone at half the price'and with the promise of 10 Gbps a few years down the road. 'But we had concerns that we wanted to be sure we could satisfy,' Kirsch said. 'ATM is very scalable.' That was a critical concern because of the Pentagon's 25,000 users and more than 100,000 IP addresses. Another uncertainty was whether Ethernet virtual LANs could match the performance of ATM LAN emulation. 'We're looking at 200 VLANs in Wedge 1 alone,' Kirsch said. The 4,600 users scheduled to go online in the first wedge in February do not represent a particularly large network, said Bob Marini, program manager for General Dynamics Corp.'s Pentagon above-ground telecommunications renovation contract. 'If you look at the 200 VLANs, though, it is probably one of the biggest installations of its kind,' he said. About a year ago, officials gave Marini and lead systems engineer Michael L. Watson the tasks of determining whether Gigabit Ethernet would work as a wedge backbone and, if it does, selecting the hardware for the job. Marini and Watson began evaluating products from 31 vendors. By March they had pared the list to eight vendors: Alcatel Data Networks of Ashburn, Va., a subsidiary of Alcatel Corp. of Calabasas, Calif.; Cabletron Systems Inc. of Rochester, N.H.; Cisco Systems Inc. of San Jose, Calif.; Extreme Networks Inc. of Santa Clara, Calif.; Foundry Networks Inc. of San Jose, Calif.; Juniper Networks Inc. of Mountain View, Calif.; Marconi Communications of Warrendale, Pa., a division of Marconi Corp.; and Nortel Networks Corp. of Brampton, Ontario. By July, when testing began at a General Dynamics lab in Arlington, Va., the list was down to Cabletron, Cisco, Extreme, Foundry and Marconi. Physical configuration of the switches was important, because the 19-inch racks originally meant for ATM equipment already were in place in Pentagon wiring closets. Another initial discriminator was network management software. The switches had to interface with Hewlett-Packard Co. OpenView, which the Pentagon uses as its manager of managers. Final evaluation and performance testing took place in August and September. Besides performance, the testers considered market presence, support plans, Layer 2 and 3 feature bases, and switching architecture. Performance testing focused on packet loss and the ability to keep VLAN traffic separate from other traffic. The testers used the SmartBits 6000 device from NetCom Systems Inc. of Calabasas, Calif., now Spirent Communications Inc., with a Gigabit Ethernet module to generate Layer 2 802.1Q packets. 802.1Q is the Institute of Electrical and Electronics Engineers' VLAN standard for Layer 2 switches. Each of the wedge's five floors has 16 wiring closets, so the test used 80 Gigabit Ethernet ports and emulated 4,600 simultaneous users on 200 VLANs. Nor were there surprises in the second key test'data loss. Each switch met its own specification for dropped packets. When the total scores were compiled, the results were unambiguous, however. Extreme Networks' BlackDiamond modular switch took the lead. Marini said the test results represent only the switches' relative fitness for the Pentagon installation. Extreme Networks' switch scored 2.62 on a weighted scale of 3; other switches came in at 2.40, 2.37, 2.34 and 2.08. The BlackDiamond has a dual load-sharing switch fabric capable of switching 128 Gbps through the backplane. It has slots for eight blades each with up to 12 Gigabit ports, handling up to 96 ports per switch. ATM will not disappear from the Pentagon, however. It still will form the buildingwide core connecting the five wedges, and in Wedge 1 it will still be used in one classified network. Kirsch said he believes Ethernet has a long future in Pentagon backbones.